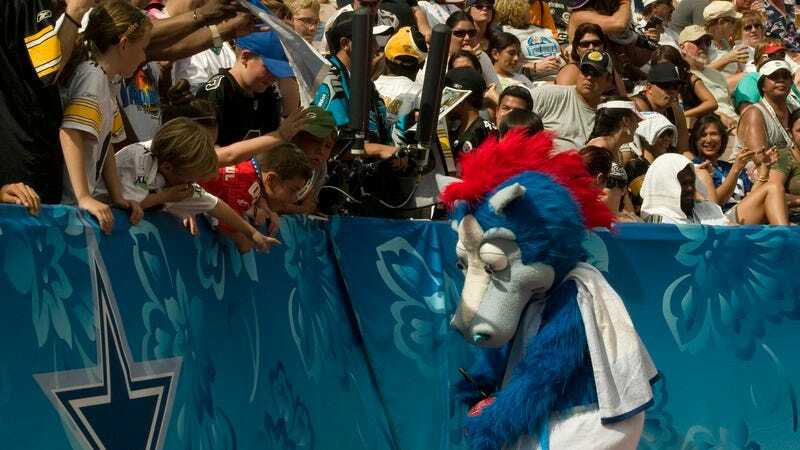 It’s easy to forget about NFL mascots, and maybe that’s for the best. When games are broadcast, they’re usually relegated to couple of seconds of off-field footage when the cheerleaders are taking a breather. At live games, if you’re lucky, any wildly gesticulating mascots are far away from your vantage point. Overlooked or not, the mascots are definitely there, lurking in the NFL periphery, waiting to advance into the foreground like some type of horrible tenso sequence. Of course, not all NFL mascots will send a cold shiver down your spine. Some of them aren’t so threatening at all. That’s why Kissing Suzy Kolber has created a handy ranking of NFL mascots in order of creepiness. Coming in at #28—i.e., least creepy—“Toro” actually looks cute, in an “I’d like throw a tight spiral at that headpiece” sort of way. But something strange starts happening at around number 18’s “Jaxon De Ville,” who is clad only in a stuffed thong. As derision gives way to revulsion, we begin to wonder who is responsible for the Tampa Bay Bucanneers’ “Capt. Fear,” and why they designed his skull-and-bones mustache braids to sit perfectly in the corners of his mouth like chunks of dried spittle. Sitting near the top is “Poe,” the Raven’s raven, which inspires no questions, only a strong feeling to regress to thumbsucking. If you’re quiet enough, you can actually hear your own essence being sucked in through its eyeballs, while you remain powerless to look away. For the rest of the mascots, including the H.H. Holmes-ian grinning maniac at the #1 slot, check out the full rankings at Kissing Suzy Kolber.